The boys love doing something fun after school so one day last week I decided to set up a ‘Dinosaur Dig’ ready for when they got home. Incidentally – I thought this activity was about archaeology, because we’re digging stuff up. It isn’t. It’s about paleontology – the scientific study of life. So that’s me told, then. Thanks Google! You can find your nearest stockist of Schleich toys here. They retail at around £2.99 each for these mini dinosaurs. Once the plaster was dry, I gave the boys some digging tools (a spoon and a blunt knife) and they set to work. I was really surprised at how long it took to dig out those dinosaurs actually – it’s harder than it looks! Eventually dinosaur number one was free, and off he went for a bath! All of the figures withstood the trauma of being encased in plaster and subsequently dug up with blunt instruments – in my eyes that’s a sign of a very well made toy. Not one of the dinosaurs lost any colour or markings during their ordeal and I’m convinced they’re the kind of toy that will quite literally last a lifetime, just like the memories we’re making as we undertake our little after school adventures. 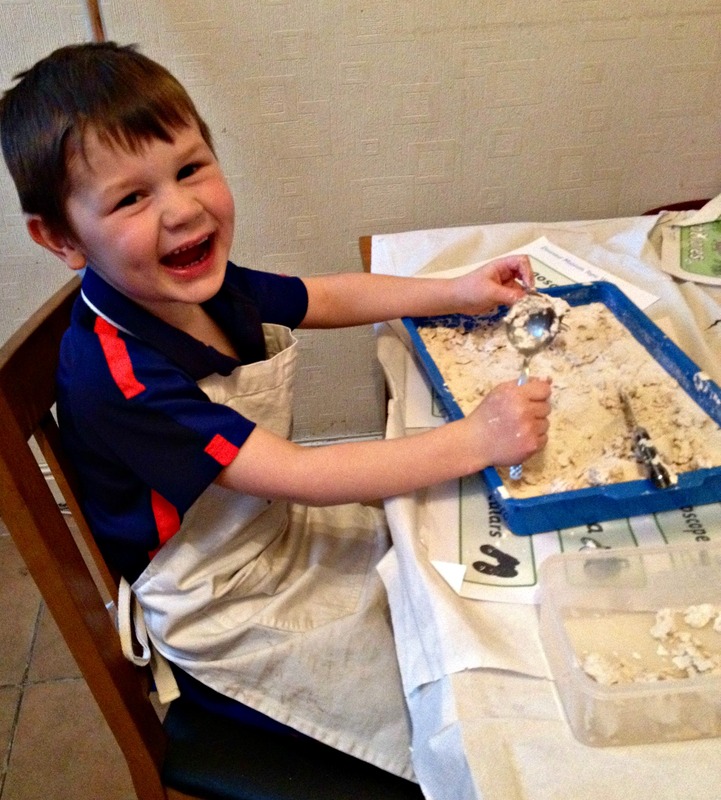 Just look how happy that little face is – all because he dug a dinosaur out of a litter tray. The twinkl resources were fantastic. We made our own mini dinosaur museum, talked about the parts of a dinosaur as well as the different species and discussed habitat, diet and more. If you have a dinosaur superfan at home, twinkl even have a dinosaur lapbook template available to simply download, cut and stick. Do your children have toys that seem as though they’ll last forever? What are they? What’s their favourite after school activity? Lets chat in the comments! What a great idea!!!! I loved Schleich figures as a kid, I didn’t realise they made dinosaurs now 🙂 I’ll have to show my friend who’s a primary school teacher, this could be a great activity! What a great idea! Looks like they had lots of fun! Oooh thats such a cool idea, Z would absolutely love the digging and the mess!